In the 7th Congressional District race, the trade deal Tim campaign ads apparently didn't sway voters. Incumbent republican Tim Walberg holds on to his seat. Walberg defeated democratic challenger Gretchen Driskell. We spoke with Tim Walberg Tuesday night in Jackson, who said though we've been a divided county, we can all work better when we work together. For full local election results by county, click here . Republican Tim Walberg has claimed the seat for the 7th Congressional District. He provided the following statement after announcing his re-election over opponent, Democrat Gretchen Driskell. In Jackson, Walberg had a vote count of 32,843 to Driskell’s 19,566, with 71.4 percent of precincts reporting as of 12:22 a.m. 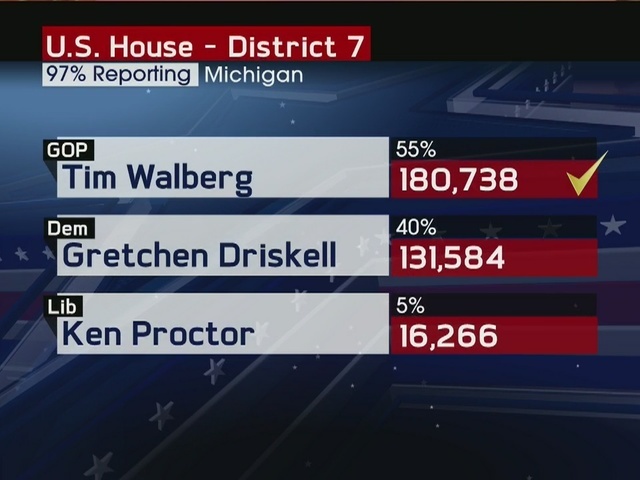 In Eaton County, Walberg had 26,727, and Driskell had 24,109 with 50 of 52 precincts reporting.